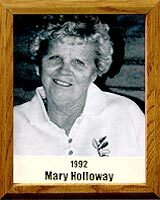 In a 1978 feature story in the Arizona Daily Star, Mary Holloway was headlined as “Tucson’s Lone Woman Athletic Director.” In this unique position, Mary never credited herself with the fact that Flowing Wells High School girls and boys sports share the limelight, but many others say she certainly made a difference. She was instrumental in seeing that the girls got the equipment, warm-ups, meals, travel bags and nice buses they deserved. But, as a physical education teacher and coach, Mary wasn’t just oriented to women’s sports. She was sensitive to the needs of everyone in sports. During her long career at Flowing Wells, she sponsored the Girl’s Athletic Association; coached volleyball (the only interscholastic sport); coached the gymnastics and track teams to divisional and state championships and in 1977 received the Girls Track Coach of the Year Award. She also served as president of the Southern Region of AA Conference Athletic Directors and was tournament director for the All-City Girls Softball Tournament. Ted Sorich, Men’s Athletic Director at Flowing Wells, is quoted as saying of Mary: “She’s more apt to refer to the girls, but she’ll speak for boy’s sports too.” Mary Holloway, “A Lady Who Led The Way,” graduated from Amphitheater High School and received her Masters of Education and Administration Certificate from the University of Arizona.